The Grain's music consists of a balance of well crafted original songs and classic cover tunes that often lead into extended solos and jams creating a musical environment that engages both the mind and body. For the past 5 years the Sonoma County-based group, The King Street Giants, have brought their own special version of New Orleans music to the Bay Area. 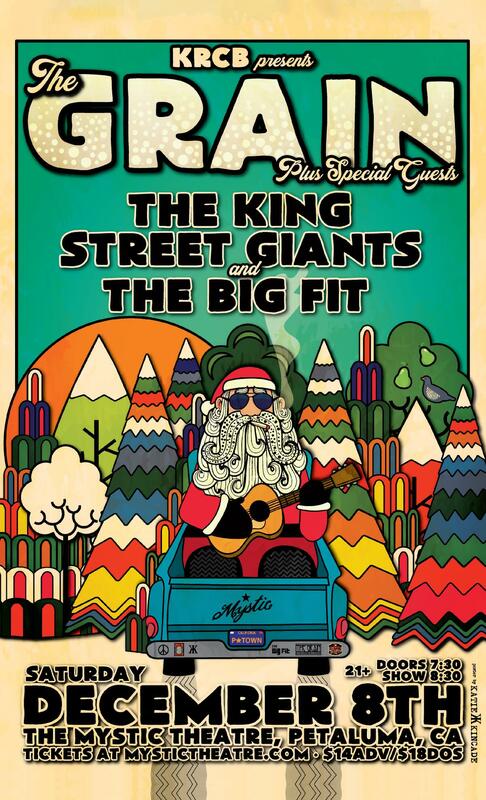 Whether they’re playing in clubs or on the streets, The King Street Giants are infamous for radiating an infectious energy and always having a blast. While continuing to play the music of their heroes (Louis Armstrong & The All Stars, Preservation Hall Jazz Band, Thelonious Monk, Jackson 5), they have also been writing original music in an effort to continue to evolve the idiom of Traditional New Orleans Jazz. Since 2005, the band Frobeck has been astonishing audiences throughout Northern California with their unique blend of Pop, Funk, and Rock music. Now, in 2018, the lineup has changed, along with the band name. Frobeck has become The Big Fit, and with the name change comes an even funkier new sound. With high-octane vocals, well crafted songs, and world-class musicianship, The Big Fit is as ready as ever to continue to rock the Northern California music scene. In 2008, Frobeck won a North Bay Music Award (NORBAY) for Best Rock Group and also won first place at the Mystic Theater Battle of the Bands in Petaluma. As The Big Fit, the group strives to excel along the same avenues Frobeck put forth, with as much sonic intensity as ever.